Description: BN train 133 rolling through Mt. Vernon. Description: BN train 133 just south of Silvana heading up English Hill. Description: Risked my life on the busy hiway overpass for this shot. Description: BN 2221 East crawls up the grade at Index. 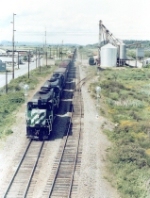 Description: BN 133 rolls downward into Bellingham by the Cement Plant. 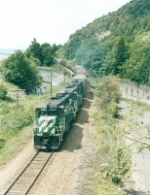 Description: BN train 133 exiting the Chuckanut area near Blanchard.